Now which device would you use where, for what and when. A tablet PC in the ward, a tablet PC, a computer on wheels (COW) or an ergonomic computer on wheels (COW)? On ward rounds, the majority of tasks (57.3%) were completed using a generic COW, while 35.9% were completed using a tablet PC. 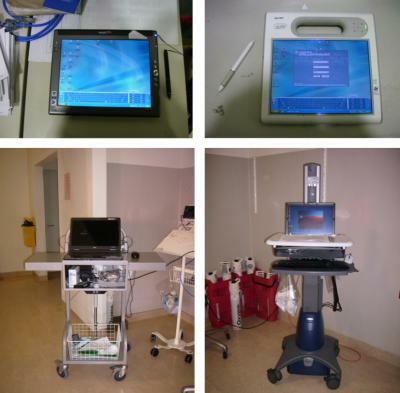 These two devices were most frequently used in the corridor, followed by the patients’ rooms, to review charts and view results. Use of a tablet PC at the workstation was observed more often than the use of a stationary PC (Table 3). Of the 234 clinical tasks completed during ward rounds, 57.3% were undertaken in the corridors, 29.1% in the patients’ rooms, and 3% at a patient’s bedside. When not on the ward they mostly used a stationary PC. They did not use a tablet PCs or the ergonomic COW when not on ward rounds. They used the stationary PCs to view results and review charts, and generate discharge summaries, most often within the doctors’ office. The generic COWs were preferred because of the space on the trolley and storage space. Another important factor was the size of the large screen, allowing more persons to view the screen. They preferred the tablet PC if they weighed less and had a handle which made it easy to transport. The ergonomic COWs were not preferred because the available table space in front of the screen was limited. Also, the ergonomic COW had a 14″ screen, whereas the generic COWs had a 17″ screen. The ergonomic COW was also reported as being “hard to push around”. The preferences for nurses did not differ from those of the doctors. Isn’t the one bottom-left “the machine that goes Piiinnng!”? That’s it. I knew it from somewhere……. Fascinating – did you gather any information on handheld devices? Do you suspect the “in patient room” or “at patient bedside” response rates look different if you had included those? It’s of interest because we make iPhone apps for use while on rounds (U.S.). Germs generally live a lot longer on plastic surfaces than on paper. Very usefull article. I like the user-centric and the down-to-earth approach. I referred to it yesterday in a meeting about hardware selection criteria.